I'm proud of the brochure I made for my CS department when I was a member of the CS Ambassadors club, one year ago. 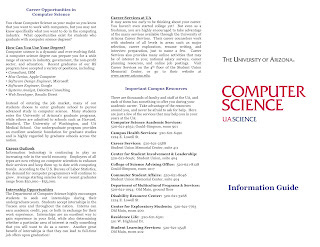 I realized that my CS department wasn't all that great at describing what it was about—and I imagine it isn't just my university that has this problem. 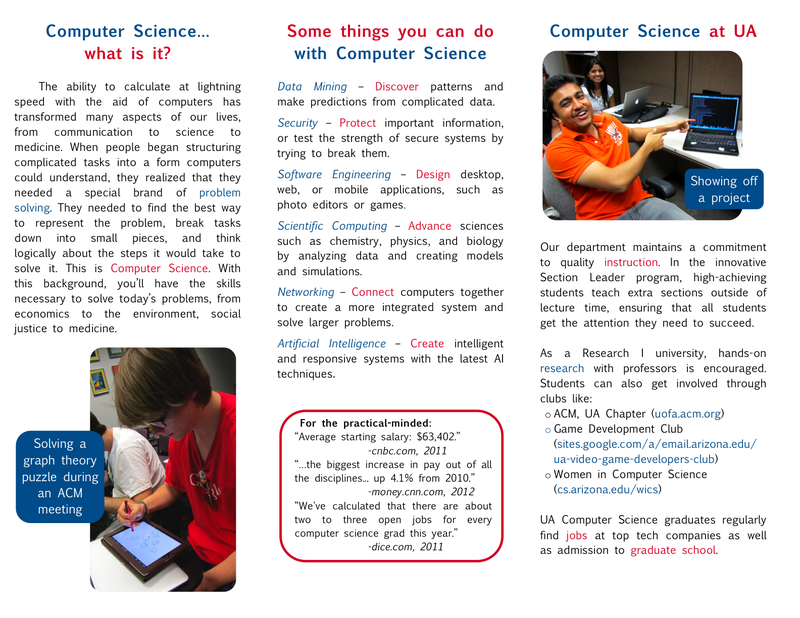 I believe that if a department can't describe Computer Science in an intriguing way at university and outreach events, they're throwing away a valuable method of drawing in new students. Mainly those who already know about Computer Science before college will enroll, which bodes badly for diversity in your department. Here is the original flyer (click to enlarge if you like). To be fair, it's more an "intro to the major" brochure than an outreach brochure, which could explain the wordiness. But that can't explain the picture of a guy looking into what I assume is a chemistry machine? Or the idea that one of the best jobs you can get with this degree is Mac Genius? If you can find some use for my original Word document in your own project, feel free—it's here [docx, 23.3 MB]. If you don't have the font I used, it's here. I also welcome your comments for improvement! If I were to redo it today, I'd probably search for better links for the CS-related games and resources section—maybe there is something more interactive than downloading those books I recommended. I would also try to make it look more professional. But I think it represents our department pretty well, and at least now there's something to hand out to potential students. We might not be able to compete with the gorgeous, glossy brochures from engineering without professional graphic designers, but hey, it's a start. 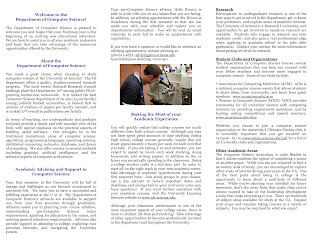 After the jump, see more examples of what I think makes good advertising for Computer Science departments. 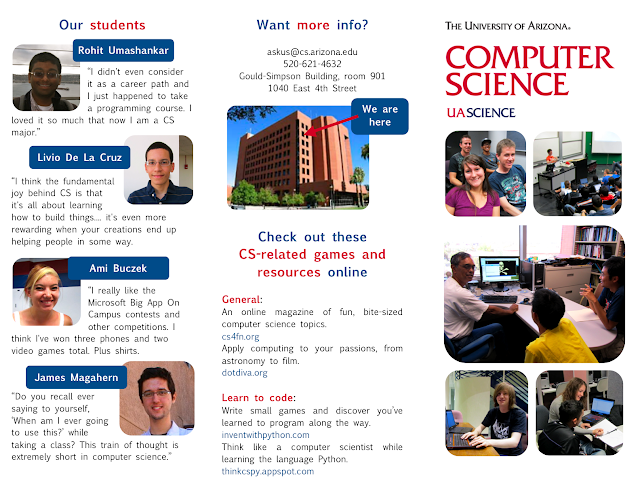 I came back from studying abroad and somehow my CS department was now a CS and a "SISTA" department. 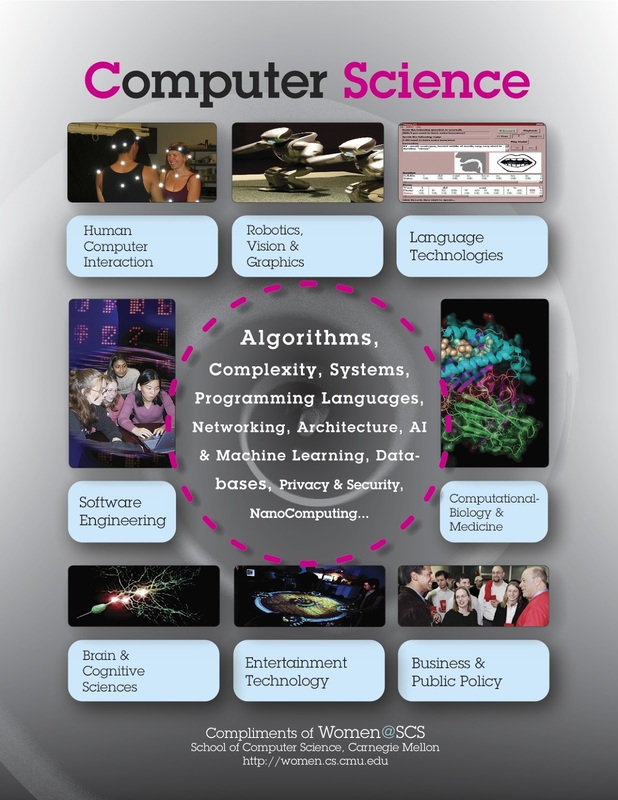 SISTA got all the more modern CS topics like Machine Learning, Game Design, and everything to do with data. I was confused, but the fact remains they are really great at advertising Computer Science topics, even though they've rebranded them. The picture below is from a series focusing on the human element and straightforward explanations of computational research—it makes sure people understand that if you code a computer, you are still a regular human being. 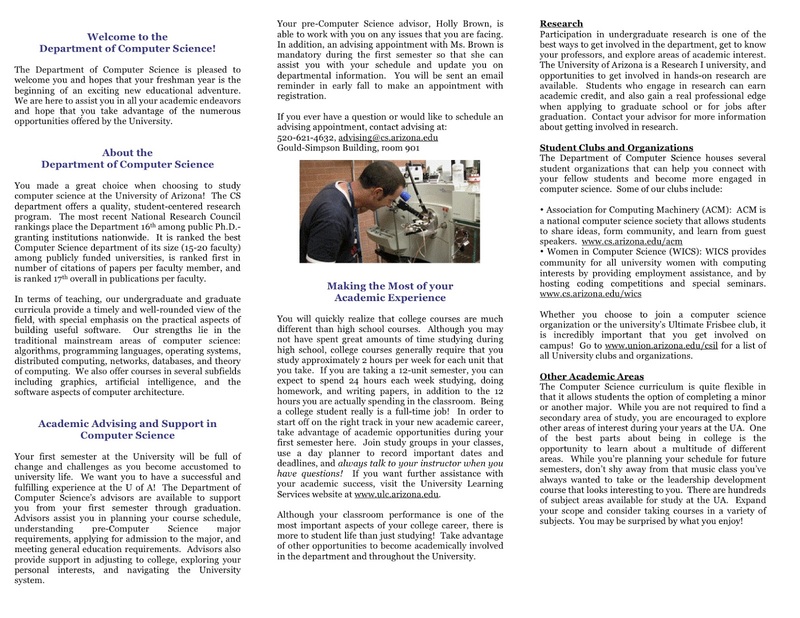 I also like SISTA's emphasis on the fact that computational methods will be the basis for many future advances. Outside my university, I am a fan of outreach materials by the fantastic women@scs group at Carnegie Mellon. 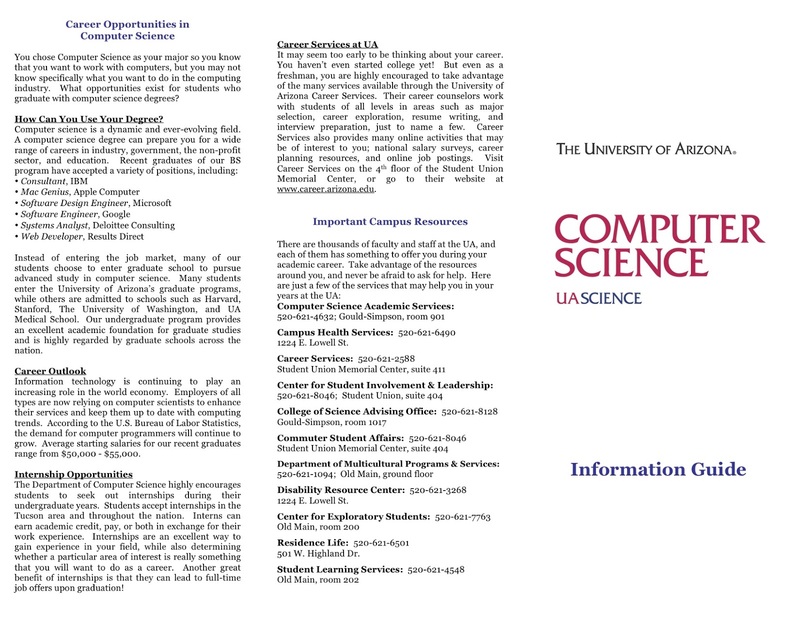 Do you have any more examples or tips for advertising Computer Science departments?